​"Hand, hand, fingers, thumb. One thumb one thumb drumming on a drum. Dum ditty dum ditty dum dum dum" writes Al Perkins in the beloved children's book "Hand, Hand, Fingers, Thumb." As a young girl, my mom taught me how to play the piano. Like many young kids, I would moan and groan for the full 20 minutes my mom asked me to practice each day: one thumb, two thumbs, pounding-the-same-eight-notes in a scale over and over and over was not nearly as much fun as running through the sprinklers outside with my friends. I really disliked practicing the piano every single day, that is, until my skills increased, my fingers strengthened, and suddenly I was able to play the "fun" songs I enjoyed. As I grew from young girl to adolescent, I continued my study of piano, and after several years of classical training as a teenager, at age 15 I was privileged to perform with my professor at the Beijing and Shanghai conservatories of music in China. I had found joy and passion in an art that I once dreaded, and my hard work was rewarded with an unforgettable experience I cherish and reflect on nearly 10 years later. The movements of fingers, wrists, and hands are called fine motor skills, and with each passing month your baby reaches exciting milestones in this area. Did you know that within a couple weeks after birth, your baby can move their arms symmetrically? At two months old, your baby will grab and scratch at her clothes, and will grasp your finger if you touch the palm of her hand. At 6 months, your baby will start transferring objects hand to hand, straightening their elbows when they reach, and will use a raking motion to get small items like Cheerios with their fingers. By one year, your child will point with their index finger, clap, and use a "pincer grasp" to pick small items. A book definition (from the Encyclopedia of Children's Health) defines fine motor skills as "small movements of the hands, wrists, fingers" and also includes "feet, toes, lips, and tongue." Things like splashing water, doing up buttons, and picking up small pieces of food are different ways a child uses fine motor skills in daily activities. It's important to work on developing these fine motor skills so writing with a pencil, using utensils, and buttoning and zipping on clothing becomes an easy task in later childhood. Al Perkins continues writing saying, "Hand picks an apple. Hand picks a plum. Dum ditty dum ditty dum dum dum." The movement you'd use to grasp an apple, open a jar or squeeze a stress ball is known as the "power grip." A full, closed hand grasp using all fingers and thumb is a movement you see starting in infancy, but is a movement refined as the months progress and is used throughout our lives. Fine motor skills are an important aspect of being able to have a good quality of life because they help us to function and do big and little tasks with ease. Take some time with your child to work on their fine motor skills, as well as your own! 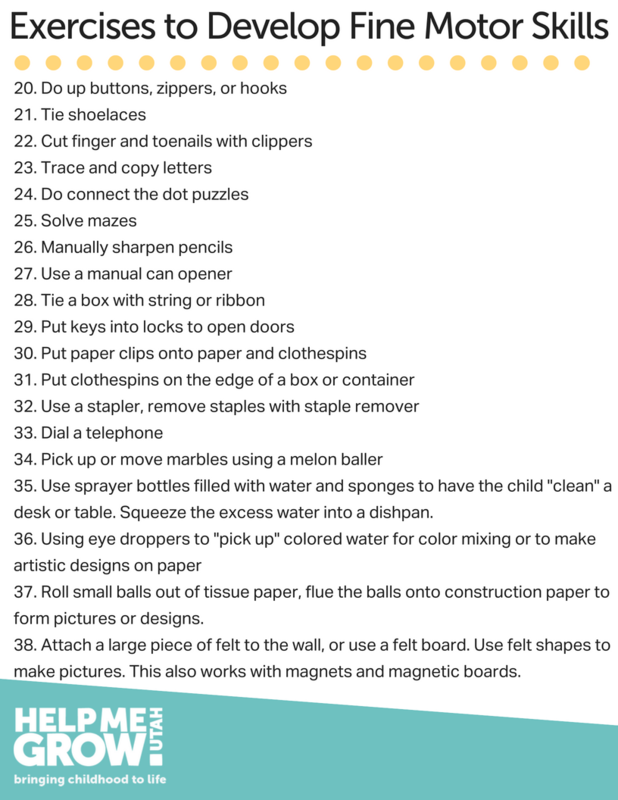 Below are some exercises you can use to help your children develop fine motor skills. For more ideas you can visit our Pinterest board.